The idea that the ancients believed in Antipodean lands to balance the globe is a modern invention – and wrong. One well-known narrative would have us believe that the Antipodes – the notion of southern hemispheric lands – were conceived out of fealty to ideas of symmetry and balance. On a spherical earth, symmetry requires a mirror of the oikoumene (the Greek word for the known and inhabited world): how could there be balance without equal land on the top and bottom of the apple? Though this is a widely repeated myth, there is no evidence that the ancient Greeks believed it. While they did create the concept of Antipodes, too many of the key sources are lost to know the reason why they did so with any meaningful certainty. What do we know? A document authored by the chronicler Strabo reports the work of Crates of Mallos (c.180-150 BC), although care is needed here, for Strabo and Crates are separated by a century and a half. The latter was a Homeric scholar who was particularly exercised by a comment in the Odyssey about Ethiopians being ‘sundered in twain’, meaning some lived where the sun rises and some where it sets. Crates wanted to reconcile this observation with his contemporary knowledge of the earth being a sphere. He understood that two river oceans bisected the globe on opposite axes, one running north-south, the other east-west. Crates’ solution was to posit two populations of ‘Ethiopians’ in two separate landmasses. One group lived in a land on the southern side of the equatorial ‘river ocean’, while a second lived in a more westerly southern land separated by the river ocean that ran north-south. There is no principle of symmetry at play, explicit or implied (three landmasses in four quadrants does not a symmetrical globe make). Nor is there any hint of a principle of global balance. Crates’ Antipodes were theorised for purposes of literary criticism. Once conceived and established in the first and second centuries bc, it was not symmetry and balance that kept the idea of southern lands buoyed through the ancient and medieval periods, but rather the simple potency of tradition and authority. The Antipodes appear in enough documents to suggest it was a well-known and well-appreciated concept, with authors rarely feeling compelled to offer a reason for their inclusion of southern lands on maps or in text. As an ancient idea and one of inherent interest (the idea of other lands seems always to have appealed to the human imagination), deference to authority was considered sufficient justification for the Antipodes. That changed in the early 1500s, when the nebulous notion of the Antipodes evolved into the much more concrete form of Terra Australis. This notion drove many of the most important voyages of the Age of Exploration. This, too, had nothing to do with symmetry or balance and everything to do with authority and the burnishing of knowledge. One voyage is definitive in the history of Terra Australis: Ferdinand Magellan’s 1519 expedition, in which he rounded the South American continent by way of the straits that now bear his name. 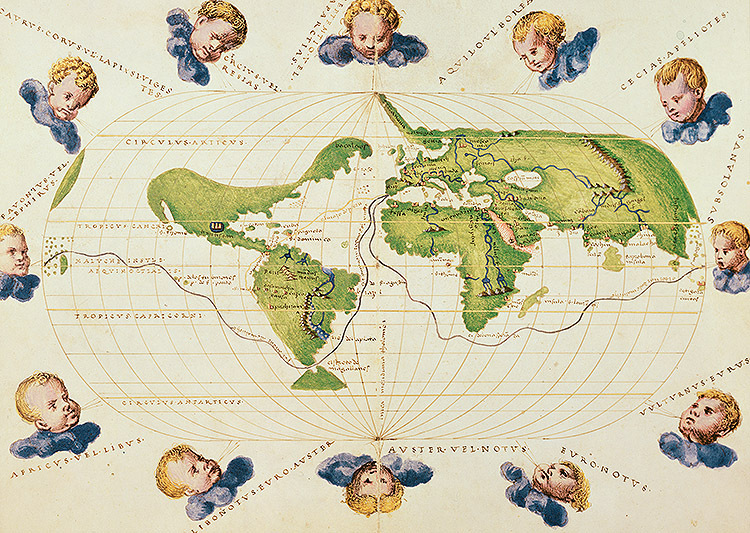 Magellan did not know whether the lands to his south (Tierra del Fuego, the archipelago off the tip of South America) were islands cosmographers in Europe did not want to believe such a thing. Rather, they concluded that the land Magellan encountered was part of a mainland that had been theorised to exist in the form of the Antipodes. Given it was just as cosmography had posited, it was taken as proof of the ability of ancient theories to predict reality. More than that, it was evidence that a southern continent could indeed be found to stretch across the entire unknown southern hemisphere. It was the exact discovery needed to cement Terra Australis into cosmography. Without that discovery – had, for instance, Magellan rounded South America by way of open sea – it is unlikely Terra Australis would have become the idée fixe that it did. And what of symmetry and hemispheric balance? Although some maps certainly present a symmetrical-looking quadripartite cosmography, symmetry played no role in the perpetuation of the idea of Antipodes in ancient, medieval or early modern times, whereas the question of balance did eventually arise, though not for some time. There may be earlier proponents of a theory of hemispheric balance whose thoughts are now forgotten, but the first record of such a theory is associated with Mercator at the end of the 16th century, more than a millennium and a half after the Antipodes were first conceived. Little attention was paid to Mercator’s theory for a further century and a half, until the cartographers Philippe Buache and Charles de Brosses popularised arguments about hemispheric balance around the mid-1700s, at the same time that a young James Cook was beginning his merchant navy apprenticeship. By the time Cook was commanding his own ships, his contemporary, Alexander Dalrymple, was holding to the theory of hemispheric balance as proof that the continent of Terra Australis was still there, albeit further south than first thought (and it was Dalrymple’s opinion that he was just the man to discover it). Ultimately, the theory of hemispheric balance was not denounced on theoretical grounds; it was simply made redundant. With his relentless scouring of southern latitudes in his 1772 voyage of exploration, Cook proved there was nothing in those spaces long reserved for Terra Australis beyond ice, islands and vast expanses of frigid ocean. No doubt less attractive than elegant reasoning and splendid imagination, but real – inexorably real. Avan Judd Stallard is the author of Antipodes: In Search of the Southern Continent (Monash University Press, 2016).